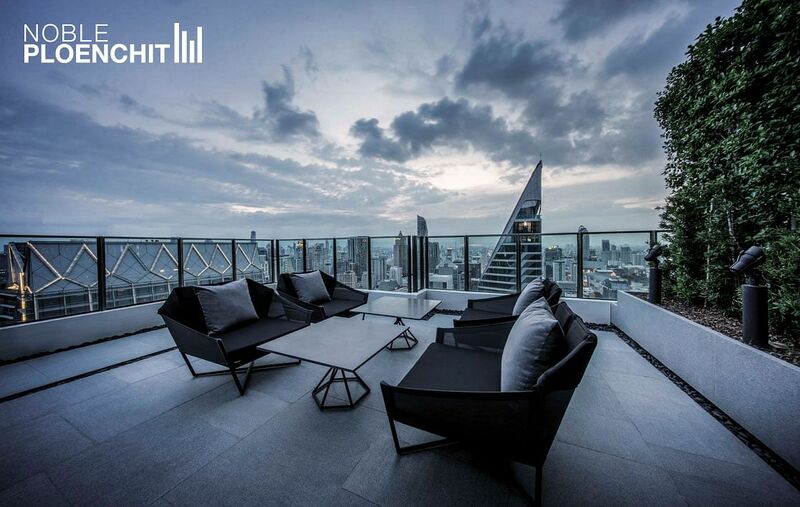 Amidst soaring skyscrapers, Noble Ploenchit, the architectural gem of Bangkok, sets itself apart from other residences in the area and it is easy to see why. We are living in the hyperconnected world, information could travel from one part of the world to the other hemisphere within a miliseconds. However, location still remains the most important factor in choosing where to live. That is why London’s Canary Wharf, Tokyo’s Roppongi Hills or Paris’ La Défense are the place where people want to live at most. When it comes to Bangkok, it is Ploenchit district – Bangkok’s most prestigious address and the epicentre of exclusive lifestyle and business where all urbanites aspire to be. 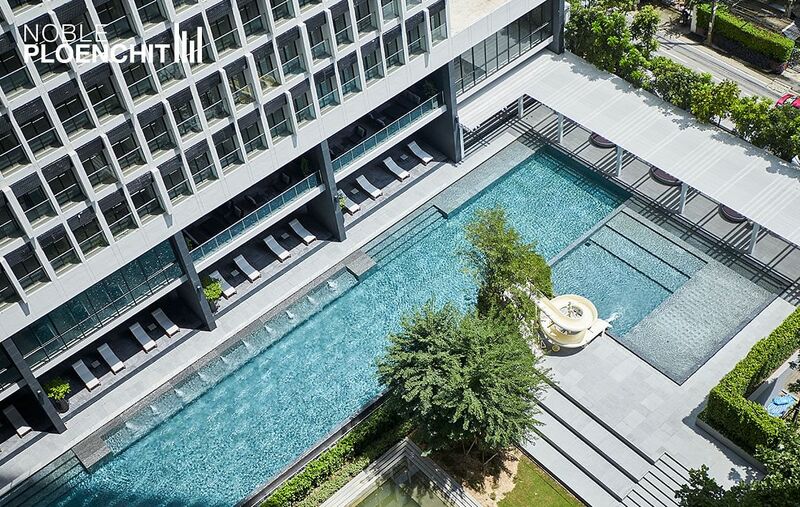 Amidst soaring skyscrapers, Noble Ploenchit, the architectural gem of Bangkok, sets itself apart from other residences in the area and it is easy to see why. Within the past couple years, Noble Ploenchit, the iconic high-rise condominium sitting in the best area of Ploenchit on a 9-rai (14,400 square meters) land plot, has redefined luxury standards in Bangkok shaped by Grade A office buildings, luxury shopping centres, embassies, 5-star hotels, upscale restaurants, not to mention the other forthcoming mega projects that will significantly add value to the area. CBRE Thailand, the market leader in real estate services, indicated that the Ploenchit-Chidlom area was expected to take its place among the city’s most luxurious locations in 2019 after the completion of a plethora of real estate projects, resulting in the dramatic increase in land prices, particularly the land plots along the skytrain route which are getting scarcer. As of the end of 2016, Ploenchit was still one of the prime CBD’s areas with the highest land prices at 500,000 baht per square meters, expected to rise to 532,500 baht by the end of this year (Agency for Real Estate Affairs). Built around the concept of ‘Future Living’, Noble Ploenchit is exceptionally designed under a philosophy ‘less is more’ by Ludwig Mies van der Rohe, a German-American pioneer of modernist architecture, utilizing simple lines to create beautiful and soothing shade within the complex. 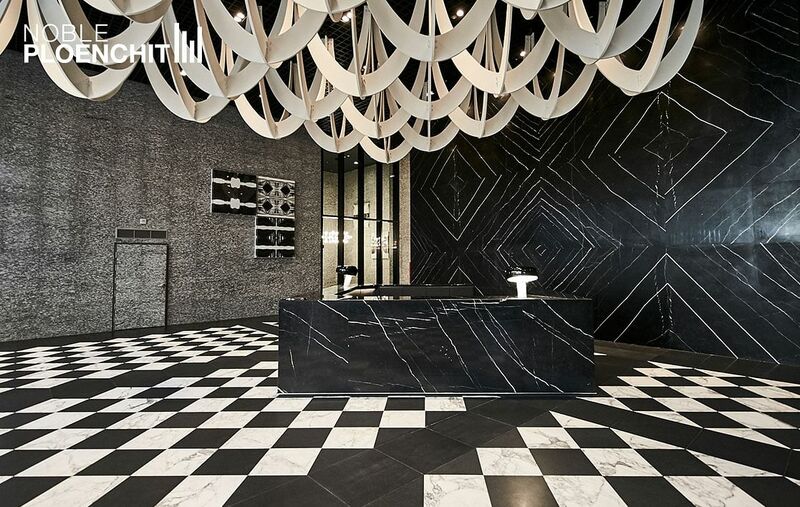 Be inspired by the minimalist design that enhances your aesthetic experience from the interplay of light and shadow that enhance dynamic form of the white-lined curvy façade to a unique pattern of white stripes against the velvety black marble at the grand lobby, echoing the architectural masterpiece of the Barcelona Pavilion in the 20th century. 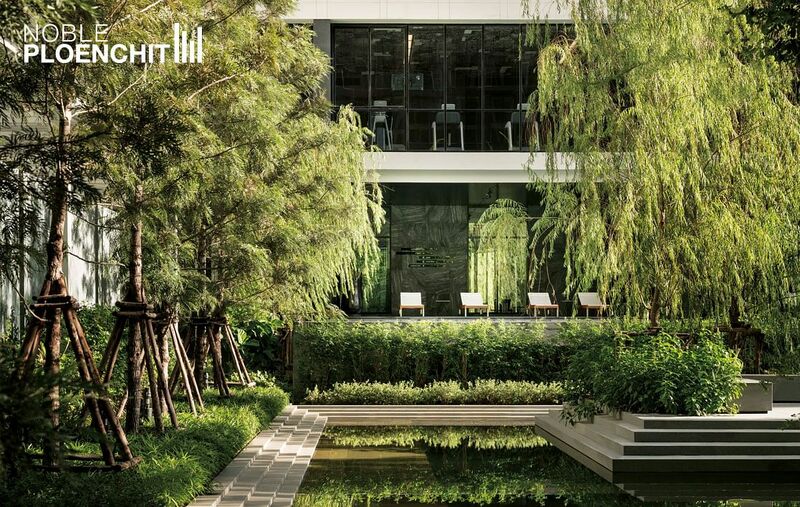 Despite being in the heart of the city, Noble Ploenchit occupies a 4-rai (6,400 square meters) green space filled with intelligently placed plants and trees that help create balance and harmony within the complex. The tall and elegant form of the complex’s Yang trees (Dipterocarps) not only help to create shade and add colour with their luscious green canopies, but also create the feeling of vertical space, seemingly reducing the height of the surrounding buildings while adding more private spaces for exploration. The concept of the vertical garden city manifests itself as a hanging garden atop each building within the complex, each designed to maximise the views from the overlooking structures. Surrounded by beautiful rooftop gardens, Noble Ploenchit is one of the few places in Bangkok where you can enjoy a breathtaking panoramic view of the city and Chao Phraya River while watching the beautiful sunset in a soothing atmosphere. Noble Ploenchit boasts to be the only residence in the area that has a private skywalk connected to the BTS Phloen Chit Skytrain Station and Central Embassy, one of Bangkok’s most luxury shopping centres. This is where the residents truly indulge in the ultimate living experience through unrivalled first-class facilities – admiring art collection at the private foyer before taking a private lift that will take you right into your living space in just a few seconds, feeling the breeze through the trees while doing yoga or sunbathing by a 45-meter long swimming pool amidst peaceful greenery, working out at the top-class fitness centre or playing pool with friends at Ploenchit Club. Noble Ploenchit is the flagship project by Noble Development, Thailand’s leading developer with milestones of success. 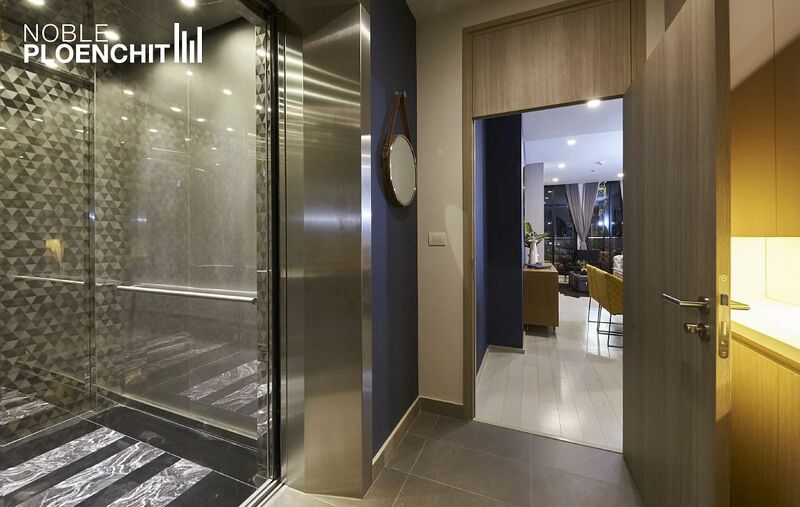 This iconic ready-to- move-in condo comes with 8 exclusive fully-furnished designs to compliment every resident’s lifestyle – echoing a sense of luxurious simplicity. With the breadth of exclusive lifestyle options and incomparable high-end facilities and amenities, Noble Ploenchit’s residents will take pride in high standards of living comfort – becoming the centre of their own universe surrounded by everything life has to offer.